What's this, another tiny, high-definition camera to strap onto your person before doing something wild and crazy? Yes, it's the latest pixel-pushing contender for high-def helmetcam supremacy, the GoPro HD Hero; a little gray box in a waterproof case that can record 1080p at 30fps, 720p at 60, and comes with a selection of mounts that will enable the thing to hang on to just about whatever you want to sling it from -- but at $299 you might not feel particularly inclined to put it in harm's way. Worth the risk, and how does it compare to the competition and its predecessors? Read on for the full analysis, and of course plenty of gratuitous high definition footage. The HD Hero has gained a bit of volume and weight compared to its predecessor, the Hero Wide, but it's still impressively small and light. Even with the new 1,100mAh rechargable cell installed it's such a featherweight that it almost feels flimsy in the hand, yet still gives a sense of quality, with a nicely rubberized coating and solid buttons. That said, the boxy design won't win any awards for asthetics, particularly when affixed to a helmet. The smooth contours of a modern lid contrast directly with the boxy HD Hero, a distinct problem for those conerned with aerodynamics -- or style for that matter. We were sent a slew of attachments of various types to test out, the primary ones relying on two-sided 3M adhesive pads that smell awful but grip fiercely to any smooth surface. 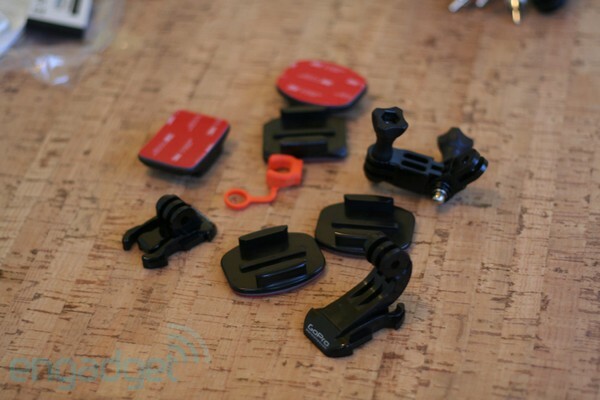 Also provided was a Panavise-sourced suction cup mount that's part of the Motorsports bundle, good for windshields or fenders, and GoPro was kind enough to send along a strap enabling it to be affixed to vented (i.e. bicycle) helmets and even a harness for strapping the camera to your chest. They all rely on the same hinged attachment point used in the earlier Hero cams, allowing mounting that is easily adjusted but, as you'll see below, somewhat less than secure. Mounting the camera requires use of a clear plastic case with the receiving end of the various mounts molded into the bottom. The camera slots in and the rear door latches securely shut, providing a waterproof seal and extra protection for little guy inside. However, that water-tight seal foils the effectiveness of the internal microphone, in the previous models resulting in only muffled suggestions of what was going on outside the case. The HD model ships with a second rear door with two large cutouts that allow the sound through. Of course those cutouts also let the water through, so you'll have to choose between audio fidelity and moisture survivability. The HD Hero has just two buttons, a shutter release on the top and another on the face for tweaking things. Via these two you'll cycle through settings and, of course, start recording. There's a tiny LCD display on the front showing the number of recordings you've made, the amount of battery life remaining, and what video mode you're in. Helpful stuff, but we usually found ourselves wishing that display was on the back. High-def video modes range from 720p30 all the way up to 1080p30, stopping at 720p60 along the way and a 960p30 mode that offers the best combination of pixels, frame-rate, and viewing angle -- if you don't mind the 4:3 aspect ratio. The camera's internal menus are a bit confusing (take that manual along) but allow for quick changes between modes and exposure settings. Videos are written to an SDHC card, which is not provided, and the works are powered by that new 1,100mAh battery pack. It's charged via a miniUSB port that can only be accessed while the camera is removed from its plastic housing, meaning no recharging while recording. That said, we filmed over an hour of video over a few days and didn't even knock a bar off the charge indicator, a big improvement over the previous Hero models. We tried a few different scenarios for our tests, focusing on motorized applications as that's the primary intent the Motorsports bundle we received. Camera charged, we used the Panavise suction mount to throw it inside and outside a car and take it for a spirited spin on some of our favorite roads. Here it performed well; the chunky design not an issue when behind the windshield and the mount pivoting in every direction and allowing easy adjustment -- though with no sort of viewfinder we were making educated guesses about where it was pointing. At a very minimum a set of molded-in gun sights on the top would be nice. Next up was a trip to the kart track for some rather more intense testing. We took one of the concave adhesive mounts and stuck it onto a Shoei then applied one of the flat ones to the front fairing on the kart itself. We started with the fairing mount, slotting the camera in, inserting the threaded screw onto the side, tightening it as much as we could with our fingers, then heading to the grid. With the camera mounted on the front of the kart we could quickly hit the record button, make sure the light was flashing, then jump in the kart and take off. The results can be seen below -- the camera lasted about five seconds before flopping forward and spending the entire session flat on its face. Lovely. Try as we might we couldn't tighten the mount any further by hand, but with with a screwdriver we were able to crank it down another few turns, much more than we liked and making us wonder when the plastic would give and the whole thing fly to pieces. That it didn't do, holding on for a subsequent test mounted on the helmet, providing a good picture and good audio... though we realized later we'd aimed it little too low. We really were guessing as to where the thing should be pointed, and having to make sure you always have a screwdriver handy is a real drag. We also had problems getting it to record. At the track you need to be suited up and ready to go well before you actually hit the track; that means helmet and gloves on. From here it's impossible to see the indicator lights and to tell whether the camera has started recording. Indeed in multiple sessions we pressed the button but not hard enough, so no recordings were made. The camera does emit some beeps when it starts and stops, but they're far too quiet to be heard with a helmet on and any sort of din in the background. 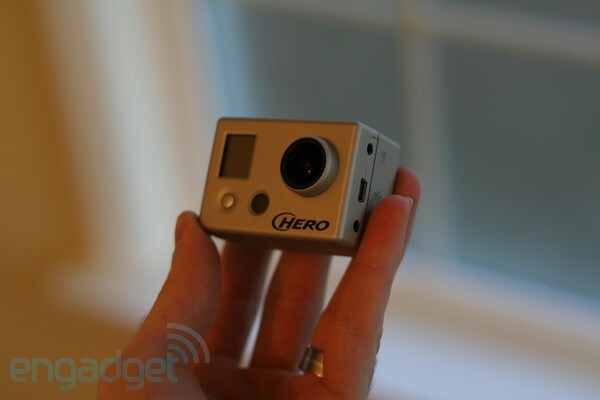 The first competitor for the GoPro HD is either of the older GoPro models, the original Hero or the Wide. Against these two there's only one reason to choose either over the new: cost. The Wide can be had for $139, less than half the new one, but for the extra money you get markedly improved video quality -- and we're not just talking about more pixels. See for yourself in the video above. The HD Hero produces bright and clear images at 1080p with little if any visible encoding noise. You'll need a good sized memory card to back that, though, at about 100MB of footage per minute at 1080p, with 720p60 videos not taking up much less. But, invest in a 16 or 32GB SDHC card and you'll be good to go for most of the day, and the quality is worth the consumption. On top of that there's the issue of audio quality, or the lack thereof in the original models. The vented rear door on the new case (and surely some internal tweaks) results in impressively good sound. Even at speed only a modest amount of wind noise muffles the experience. It's a huge leap forward and the best we've yet heard on this type of camera. 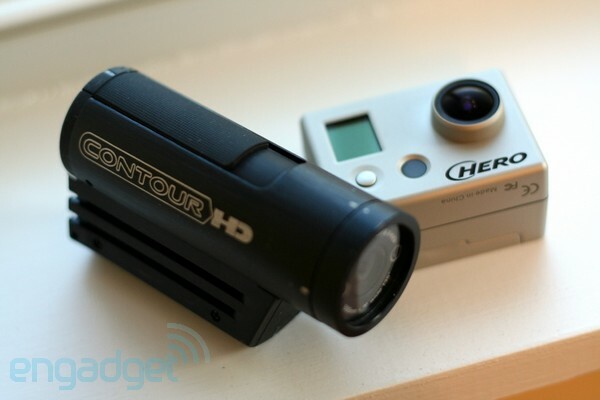 Which takes us to the next competitor: the ContourHD 1080p we tested a few months back. One of the biggest complaints we've had with the ContourHD line of cameras has been excessive wind noise at speed and, while the 1080p addressed that somewhat by allowing for reduced microphone sensitivity, it's still far more intrusive than on the Hero. That said, there are plenty of reasons to like what it has to offer, the primary one being design. It is physically larger and a bit heavier, but still far easier to use. The main reason for that is the glove-friendly sliding record button on top that lets you quickly feel whether you're recording, even when camera is stuck to the side of your head. Rotating internals means you can mount this at nearly any angle and still get video that comes out level; the Hero allows recording upside-down and right-side-up, but nowhere in between. Finally, dual lasers on the front of the ContourHD tell you where it's aiming and, with a little practice, help to ensure proper framing, and we've never had a problem with the cam's mounting solutions failing. The GoPro HD Hero is an absolutely massive step forward from the old model in terms of visual and audio fidelity. There's simply no comparing the footage you'll get from one of these to the footage from the originals and, since the design has stayed more or less the same, those upgrading will still be able to use all their old mounts. That's something of a shame, though, because we wish the company had thrown them all out the window and started with something fresh, something with teeth, and something that doesn't require a screwdriver to get clamped down in place. We'd also love a more helmet- and glove-friendly set of controls. That said, this isn't a bad choice among all the action/POV cameras out there. If you're going to be mounting it to a location where you can easily see and access it while recording (to make sure that it is, indeed, recording), like inside a windshield or the front of a snowboard, it offers stellar video and audio fidelity in a small package. However, for mounting to a helmet or use with gloves on, we preferred the ContourHD 1080p despite its poorer audio quality. It's a little bigger and, at $329, a little more expensive, but that $30 extra gets you a 2GB starter storage card, solid mounts, and a much more reassuring interface. That it doesn't look like a little toaster sitting on your helmet isn't a bad thing either. Update: We received a note from GoPro that they apparently shipped some defective mounts that could have been the cause of the failure we captured above. We spoke with other GoPro users who reported similar issues, so if you're having problems getting a stable connection contact the company for your replacement. We're awaiting ours and will post another update with the results. Update 2: Rather unfortunately the updated clamps didn't result in a more secure mounting for us; we were still able to move the device in its mount when clamped down as tightly as we could by hand. That's not to say that it was loose and flopping around, we're sure that for most applications it'll stay in place, but for situations where there is a lot of vibration or a lot of wind resistance it could be an issue. That said, if you're having problems we'd recommend contacting the company about getting an updated clamp.